Because it’s not always all-about-me (as hard as that might be to believe), the Quick Bright Things team will be penning some blogs about the rehearsals so far, their thoughts and experiences. Quick Bright Things opened last night, so I have decided it’s time to reclaim my website and add a blog of my own! Over the weekend I was asked “so, what is the point of all this?”. A blunt question that took me aback slightly, but as I had just shoved half a fruitcake in my mouth (classy) I was spared scrabbling around for an answer and someone else valiantly stepped in and explained about the project, etc. But the question has stayed with me. So, what is the point? I suppose my answer (now I’ve had a few days to think about it and there’s no more cake in the vicinity) would be ‘because we can’. Or to put it another way ‘because we’re brave enough to try’. The idea was put forward to the RSC Open Stages and when it was given the green light I think only then did we look at each other and go ‘erm, ok then’! But we got stuck in, cast and crew embraced the project and we did it. It’s done. It’s on, and last night a capacity audience toured the building and saw the action unfold. I have always admired the ambition of the People’s and Quick Bright Things is no exception. Why play it safe when you can do something new and out of the ordinary? The response from last night’s audience was terrific – they seemed to really embrace the idea and its spirit. I can only hope the rest of the week follows a similar vein and everyone involved enjoys the experience and feels proud of the achievement. To go to every rehearsal. I have been to 5. Possibly fewer. To write down the blocking in the script (i.e. where the actors move to, sitting down, looking stage right on a certain line). I only printed the script this weekend. And by now they know where they’re going. To note when all lighting and sound cues will be. Tony did this for me and typed me out a list. There are 5 cues and I’ll be running the sound and lights myself. But only once the wonderful Mr. Bailey has recorded the sound, designed and set up the lights, moved the prompt desk and generally told me exactly which buttons to press at what time. Hmm. Not doing well so far. So, the reason (excuse?) that I haven’t been that involved in the rehearsal period is that I don’t need to be. Only Part 2 has any sort of lighting and sound stuff and with very few props or costume issues I’ve not needed to work this out. With each of the parts being so short, the actors have had a great opportunity to work on consolidating the moves with the interpretation of the text. Also, with a large cast stage managing can often stray into crowd control, especially when excitement reigns in the wings. But this show is three shows. And three very small casts. Certainly no crowd control issues there. Although that Sam can be a bit of a handful at times. Dave, however, has quite a feat on his hands. Regulars of the People’s will know of “the nine day rule” where shows get a sacred nine days on the stage to build the set, paint it, program the lighting board, focus and gel the lights, set sound levels, set up furniture/stage dressing and generally do everything technical that needs doing. But the Gang Show are hiring the theatre the week before our show (good plug, Catherine – do go to see it) so Dave has just one day to do everything he, as the one crew member, needs to do. I’ll be around to help, of course. And I’ll bring my Holly Hobby screwdriver. Open the dressing rooms for the actors so they can get dressed and prepare. There are two performances per night. And one of the parts takes place in the dressing room. So there will be no sitting about, drinking tea. Going to front of house to talk to the stewards about the show. Again, with two performances per night, I will have to do this twice, but may be cueing lights and sound at the time I would normally be talking to stewards. Hmm. Welcoming the members of the audience to the theatre over the tannoy and asking them to take their seats. There will be no seats, it’s a promenade production. Giving stand-by and go cues to the lights and sound operators. Who, as I mentioned, will be me. Funnily enough, I’m not that worried about it. Because when you’ve got directors, a cast and backstage team whom you trust, all you have to worry about is the audience. LAD: What do you think it’ll be like, this? LAD: Do you think? Everyone’s coming. HELENA: Yeah, that’s what I mean. LAD: What you said, about really wanting to come. I thought why not. HELENA: I didn’t send you a note. LAD: Don’t worry, I didn’t tell anyone. Well. I didn’t tell everyone. HELENA: You sent me a note. LAD: I don’t think so. LAD: You sent me a note, it said you really – and the ‘really’ was in capitals – you REALLY wanted to come tonight but you were too nervous to ask me to my face. You did a smiley in the ‘a’ of ‘face’. HELENA: I’ve never done a smiley in an ‘a’ in my life. HELENA: Have you got it? LAD: Where’s yours, from me? HELENA: (LYING) Binned it. Why would I keep it. Walking up the Peoples Theatre stairs, I immediately get the sense of someone waiting just around the corner. And of course I’m right. It’s our director Tony Childs with a tambourine and a pencil, eager to begin the first run through of Quick Bright Things part two without scripts. Of course there is an explanation for the tambourine; the instrument is our replacement sound cue for ‘magical shenanigans’ (yes, I had to Google how to spell shenanigans) and although it makes a magical sound of sorts, it usually reduces the whole cast to laughter. Assistant Director Miranda Barty-Taylor’s pencil scribbles down endless feedback such as ‘school doesn’t have two syllables’ or ‘sloooooooooow down.’ If we’re lucky, she puts big double ticks next to sections she feels we have improved upon. Playing Helena number two has become something of a tricky business. 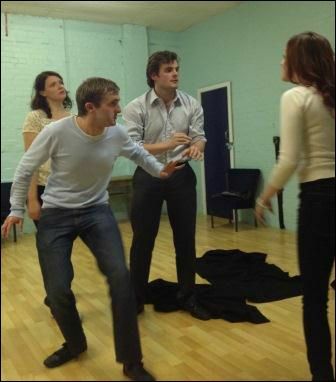 Our group of four – Helena, Demetrius, Hermia and Lysander- are all using the Shakespearean text which has been condensed into twenty minutes of chaos. To begin with, I found it difficult to make heads or tails of complex words and to remember similar worded lines. But after watching part 3 of QBT, I learnt not to complain about line learning; Moira and Penny seem to have a novella of lines to learn and both actors hardly need prompting. They are impressive indeed. Perhaps what I like most about the whole rehearsal process is playing the wide scale of emotion throughout every section. In only twenty minutes the audience watch moments of obsession, rejection, humiliation, confusion, fury and desire. They see both Demetrius and Lysander wildly crave a new love. 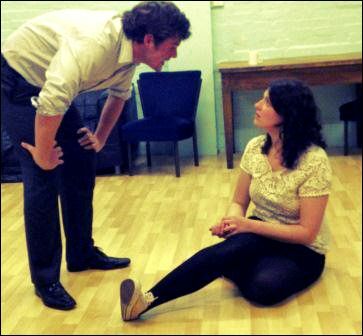 They pity Hermia, the girl who once had flocks of admirers now having none. And of course there is Helena. Eventually her prayers have been answered, but in a way she would never have imagined. Is this really what she wants? Well… Its smiles all round. 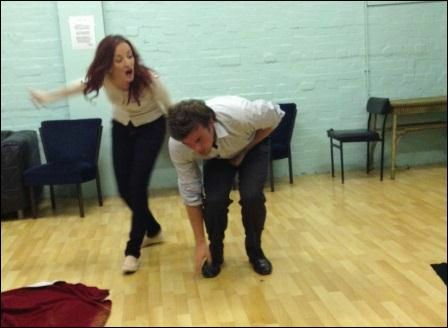 Yet another successful rehearsal in Helena’s topsy-turvy world, I think double ticks are in order! I was going to venture out to rehearse my words as Helena number 4 “along the beach-ed margent of the sea” but they really would be lost in the “whistling wind”! So I decided to write a BLOG instead. Titania’s rant to Oberon seems all too appropriate today as temperatures plummet and snow is threatened after last week’s summer weather! Yes alright – I have been in “A Midsummer Night’s Dream” before but never in a million years dreamt I would get to play the part of Helena because I thought I would be too short or is it too “dwarfish” and “low”? 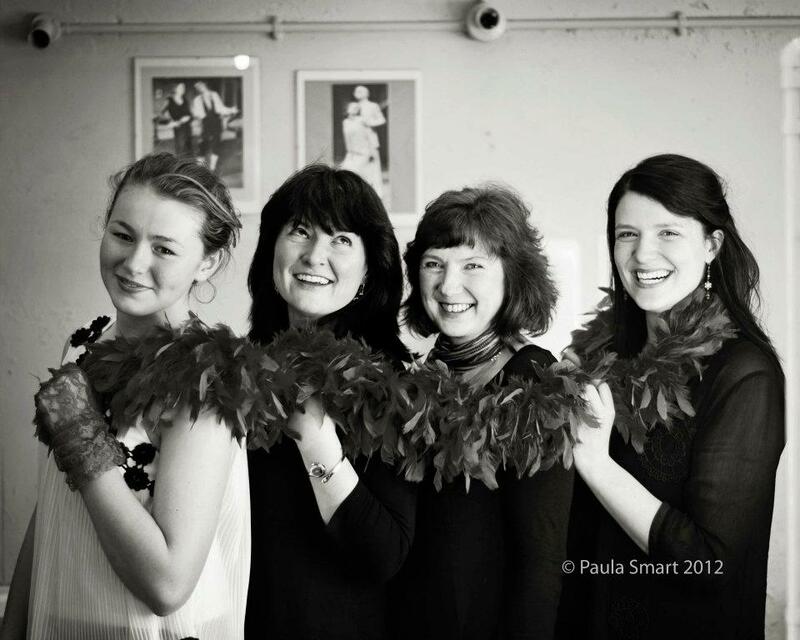 All four Helenas met for the first time last Monday for a photo shoot with Paula Smart. As you can see I’m the shortest even in my heels – thank goodness the other 3 Helenas wore flatties! Moira and I are both doing the same monologue as the older, disappointed and disillusioned Helena. It’s weird doing the same piece simultaneously. Like Moira, I’ve only had 3 rehearsals so far but have spent a lot of time learning my lines. Nearly as many non sequiturs as Pinter – thanks Alison! My preferred method is to walk along the beach spouting them to the waves – yes like my Helena “Sometimes. Once. More than once.” I’ve had strange looks! I then recite them in my head before I go to sleep – not very soporific – I don’t think I got a wink of sleep last night! Moira and I have decided not to watch each other before we perform our identical monologues. Directors Tony and Miranda keep telling me how different they will be – hopefully in a good way – but a little disconcerting nonetheless! The Dressing Room debacle is still to be resolved – Moira and I just know we’ll be in one or the other or we may even swap over during the run. Rehearsing in the dressing rooms has been a little spooky! Last rehearsal Tony said to meet him and Miranda down there but I just lurked in the Green Room rather than venturing into the gloomy corridor by myself. It does have an earthy smell and strange noises which Tony blames on the plumbing. “A Midsummer Night’s Dream” has always struck me as very sinister and spooky and Alison’s writing captures this element brilliantly with Helena’s references to some kind of “other”… “something”…”something not quite right” …”something I can’t quite see”. The dungeon dressing rooms complete with odours and noises off certainly adds to the spooky ambience. At least I can whistle a happy tune if I need to but isn’t it supposed to be unlucky to whistle in the dressing room? Oh dear! Better get back to whistling my words into the wind. Two posts on the same day? Monday was clearly very productive! 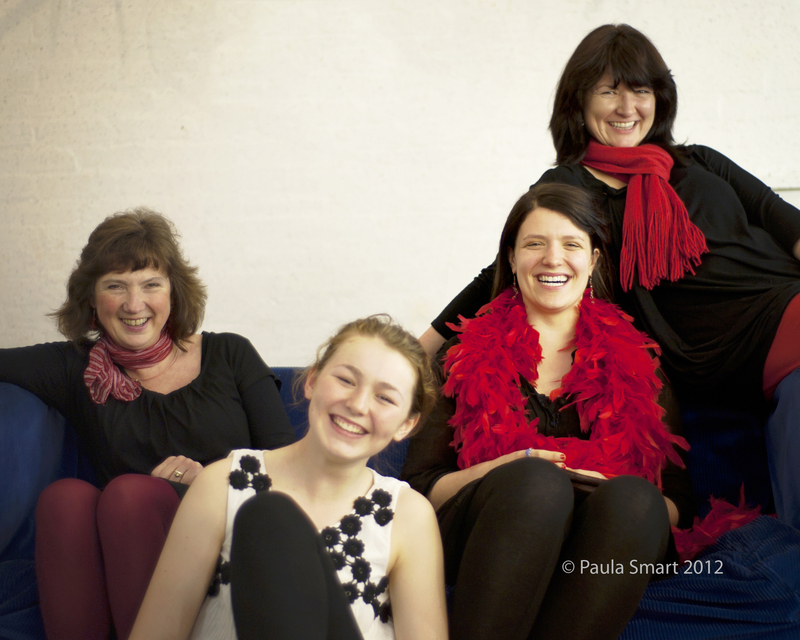 We meet at 6.30pm to hold a publicity photo-shoot, featuring all four Helenas from Quick Bright Things. It is expertly run by our photographer in residence Paula Smart, who arranges the four in a variety of poses. Efficiently, she hands out bright red accessories, and Jen Carss flouts her omnipresent feather-boa flamboyantly. They all chuckle, slightly shy – for most it is the first time they have met in person. 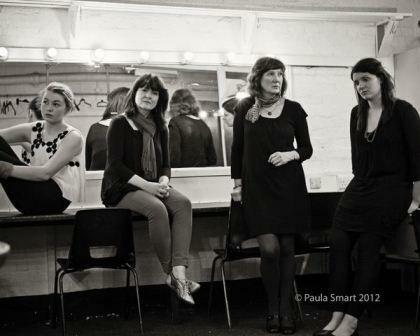 Here, then, lies the beauty of theatre; through one woman’s vision, another four are brought together to play the same part at different ages, and whilst some might baulk at the fact that they have only just met, thus far, in fact, it has mattered very little. For Parts 1, 2 and 3 represent only brief glimpses of Helena’s life, and the only aspects we are privy to, are those pertaining to Demetrius, Hermia and Lysander. Any other experiences which may have shaped Helena’s attitudes (her parents, education, career) are left to our imagination; we are allowed only these three, fleeting ‘snapshots’. Tony dares to describe the three pieces as ‘poems, rather than prose or script,’ and despite general, vociferous decrying of this as pretentious twaddle, I think he may well be on to something. Our four actresses bring forward not only those characteristics conferred on Helena through Alison’s script, but also their own attributes and opinions. Thus, during the course of the evening we meet various ‘versions’ of Helena, each founded in a fictional persona, and each interpreted slightly differently. Indeed, it is testament both to the flexibility of Alison’s writing and the sensitivity of our two Part 3 Helenas, Penny Lamport and Moira Valentine, that the same monologue has been understood and expressed in two such completely different, and yet utterly justifiable ways. One might even argue that the only way to expose oneself to the entirety of the Quick Bright Things ‘experience’ is to come and see the show twice; that way you have the opportunity to watch both versions! So – the interesting thing about a six week rehearsal period for a 15 minute monologue, is that you discover you don’t need 6 week’s rehearsal. You do, however, need the 6 weeks to learn the lines (if like me you have a full time job, too). 3 weeks in to the project, I have had 3 actual rehearsals, lasting approximately 1.5 hrs each. Most of that rehearsal time has been spent discussing the text with the directors & occasionally even asking the author herself what she thinks ‘this’ phrase means. I think I’ve said the whole piece out loud only 7 or 8 times so far. When speaking the lines, I find that my brain keeps tripping itself up. I know what background thoughts and memories I want to portray with each line, but I can’t get them out in time with the words, it seems. The directors point out a new verbal tick I’ve acquired. Worrying. Some sort of ‘e-huh’ noise I insert between words. Apparently it can be quite effective in parts, ‘but not every other sentence’, please. I have not yet learned my lines. My preferred method being to write them out longhand, I keep being surprised by each paragraph I write out. ‘When did Alison put that one in?’, I cry. ‘I don’t remember that one’. Next major decision will be the chair on which I will sit to deliver this piece. More difficult than you might think. Note: in trying to persuade Moira to write a blog, I told her she could include some quizzes if she liked. Brilliantly, she did. Unfortunately I don’t know how to add links to them here, but I played them on your behalf so take my word for it – they were aces. For those of you unfamiliar with the backstage areas of the People’s Theatre, our next play, Quick Bright Things, by Alison Carr, offers a glimmer of insight into the dedication of all those involved in the many productions. You have to be pretty bloody dedicated to sit, alternately sweating and shivering, smearing on another layer of grease-paint in the cold, unforgiving light of the bulbs around those mirrors, of which only every third deigns to flicker. And so I find myself, blinking slightly in the glare, on my precious Friday night, settling down in the Dressing Rooms, avoiding the flaky, peeling paint and trying to ignore the gurglings of the frankly temperamental plumbing, poring over the script with Director, Tony Childs, and one of our actresses, Moira Valentine. It is a monologue, lasting approximately 17 minutes (yes, we timed it) and follows the thought processes leading to a life-changing decision on the part of our heroine, Helena. Twenty years after staggering from the forest with an adoring Demetrius in tow, her expectations have been eroded, and her grip on reality starts to falter. It is a piece which explores the nature of true love, yes, but also the doubts, dreams and delusions we surely each come face-to-face with at some point in our lives. Together, the three of us thrash around ideas, exploring our way through this woman’s psyche in an attempt to present the most emotionally truthful version we can. And suddenly, it’s ten o’clock. Despite the intermittent and inexplicable bumps overhead and the equally intermittent and inexplicable wafts of dodgy costumes-past, we have become so absorbed in our task that the time shocks me. Have we really been down here for two whole hours? It is the perfect setting for Helena’s monologue, this dressing room – faded and inelegant, with a backlog of ghosts in the air; of fears, or self-doubt; of determination and desperation; of love? One that engrosses us down here for two hours on a Friday night anyway. But I’m pretty sure it’s worth it. HELENA: He would write me endless love letters. I say ‘would’, he still does. Not as many but still as … as enthusiastic as ever. Perfect. Divine. Nymph. Goddess. At first I thought he was laughing at me; mocking me and laughing like he used to. Like they all used to – huddled in corners, sniggering behind their hands. I would read his letters and I would cry. And then he would cry – promising, pleading that he was genuine – until it ended up the two of us, both with tears streaming, promising and pleading love and faith and devotion. What a pair. If he were to turn around and mutter “I fancy you”, that would get my heart racing, my cheeks flushed pink. That would mean more to me now. I used to reply. Not this (THE ENVELOPE) This isn’t a love letter. Well. Maybe it is. A different kind of love, maybe. Born from love. I have borne his love.